When we travel we like it big. We like experiences out of the ordinary and we like to try something completely new. 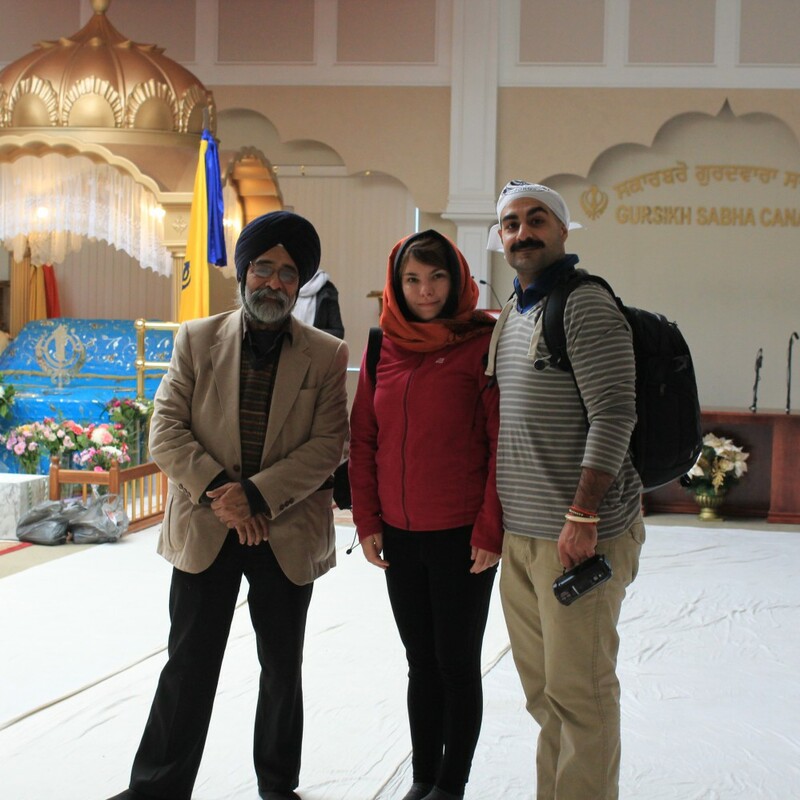 So when our good friend and world traveler Mr Singh asked us to join him on a day at a Sikh temple we didn’t even hesitate. A new adventure in company with friends what is there to think about right? We took the Toronto Go train to Danforth and took the metro to Donland where we would meet our friend. Going in the metro was an experience of its own. Old carriages that holds all types of people going to and from somewhere. The “real” people as we use to call it. The people who can’t afford the luxury of owning a car for example. As we arrived with the bus from Donland station the temple was quite impressive. A white big complex with golden domes on the roof. We entered the building and I was shown to the ladies wardrobe to the left and Leonardo and Mr Singh went to the right. As in most religions you need to cover your head and hair. Especially as a woman. This was no exception. Even though it is not specifically my religion I cover my hair out of respect for their religion and the fact that I am in their temple. It is not even something that should be considered not to in my opinion. After having us introduced to the kind men in the entrance desk we went inside. We were shown a temple inside one of the main rooms of the building. Through a long corridor we could see an altar standing proudly at the end of the bigger room. We entered the room and it was filled with huge white sheets on the floor and a hand woven carpet. It was a light room with a chandelier hanging from the ceiling and a roof window spreading natural light over the altar. The altar had a golden roof itself and had something that looked like a coffin covered with embroidered cloth. A man sat beside the altar. He looked like he was in some kind of meditation. Mr Singh said a prayer and he introduced us to the symbolism of the different items that were placed around the altar. The man, an older man dressed in proper Sikh uniform, was the days keeper of the altar. As you have said your prayer you are given “Halva”, a sweet, oily paste as offering by this man. The man later gave us the privilege to see what was under the cloth. It was not a coffin but the Guru Granth Sahib, the holy book. After the visit at the altar we went downstairs to the kitchen. In a Sikh temple there is always a lunch served for Sikhs or anyone who is interested in learning about Sikhism. As we entered the dining area there were big stainless steel buckets greeting us with delicious Dall, yoghurt, rice and all kinds of delicious food. Both Leonardo and I was overwhelmed with excitement. Proper Indian food! We had our plates filled and went for a seat. But here there were no chairs. You sit on the floor to eat. On carpets. This is because all people are considered equal. No child is different to God, Mr Singh explained. Whether you are a king or a servant, all are the same. That was really nice to hear. We like that. On the other side of the room filled with blue long carpets to sit on there were older women sitting against the wall preparing food for the bigger lunch the coming weekend. The people that work in the temple are all there voluntarily. They get no salary. This is their way of showing their dedication to God and .their religion. Some people also donate food or money to the temple. The women kept serving us Dall over and over until we couldn’t move anymore. With full stomachs Mr Singh insisted on having tea and desert. Sesame crackers that you eat with peanuts. A perfect end of a perfect meal. He says, here we don’t serve you as a person. We serve your soul. And now our souls were completely happy. Leonardo had one more attempt of eating another delicious Indian dish and then we went to see the kitchen. After a grand tour we were back in the corridor outside. Mr Sing proudly showed us paintings and posters about the Sikhism and its history. About women and the symbolisms. I have to say that I really like the ideas and the way of thinking in Sikhism. Sikhs believe that everyone are equal. There is not a heaven or hell but more like a state of consciousness and a result of your actions. They also believe that you are born alone and you die alone, but in between you will never be alone as there is one God and he is your best friend who is there always. They also believe in full equality of women. We went back for one final look at the altar and a photo opportunity before we left the temple. This was one of the best days in Canada so far and definitely one of our highlights on our trip. We thank our friend, Mr Singh, for having us there and for showing us the hospitality of his people and religion.